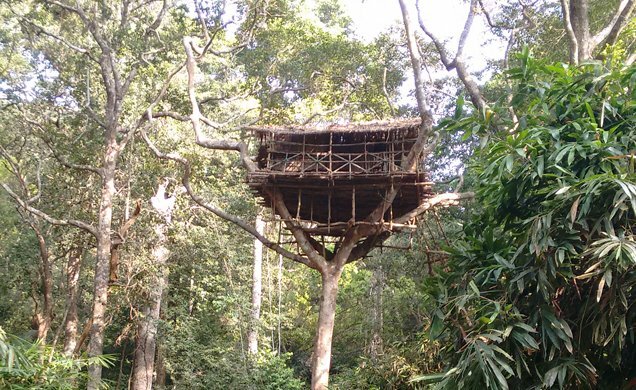 Tree House is one of the unique concepts created for tourists who are visiting Kerala to get “something different” feeling. If properly chosen, a stay in Tree House becomes a very memorable experience tourist can get during their trip to Kerala. Srees Tours, Kumarakom, which used to include overnight stay in Tree House in all the tour packages, here gives some idea about the Tree Houses in Kerala as well as how to have a memorable experience in them. The Tree House is similar to a house, which is mounted on a tree with walls, roofs, windows, and all other basic amenities, which can be used as a temporary shelter for recreation. The Tree house concept is derived from what some of the people in Kerala who lived near to the forest and mountains. In the earlier days, Kerala was covered by green thick forests, which are part of Western Ghats that includes thick forest and mountains. Most of the agricultural lands belongs to farmers who are located near to the Western Ghats are either located in the forests or nearby forests. Homes are far away from their agricultural land, they need to stay near to the agricultural land to look after and protect their cultivations. These farmers who live near to the forest are also prone to attack from elephants and other wild animals. To protect themselves, they used to construct their temporary huts on big trees and used to climb on the huts by rope ladder. Once they get into the hut, they used to fold the rope ladder so that they are safe to some extent. There are many damaged / unused huts on the tree tops that are still available in nearby forests as well as there are couple of huts presently used by forest department of Kerala on the way to Agastyaarkoodam, near Trivandrum. At present, the Tree Houses are used for recreational purpose for the incoming tourists in Kerala. Tree Fort – Constructed about 10 feet above ground, this type of Tree House includes a platform and a safety railing. It does not have solid walls or roof to let children look out from it. It is mainly built for recreational purpose. Tree House – This is like a house mounted on a tree with walls roofs and windows and can be used for storing stuff as well as for the kid’s recreation. Tree Houses in Kerala are constructed, owned, and operated by resorts located at Munnar, Thekkedy, Wayanad etc. Since its being part of a particular resort, the tourists have an option to experience the tree house also while staying in resorts. As Tree houses are part of the respective resorts, it does not mean that all the hotels or resorts in Kerala have Tree house. There are only few resorts which have good trees available around their premises can make this facility. Elevation to the Tree House from the ground level may be 10 meters to 50 meters and it varies from Tree House to Tree House. The best Tree House experience depends upon the height of the Tree House from the ground level, the view available etc. There will be steps, ladder, or suitable method available to reach the Tree house from ground. Since this tree house experience is a unique and memorable, some of the resorts have constructed their Tree House on an artificial steel pole erected from the ground level. These kind of artificial Tree Houses will surely not a good option to experience and one will not get the exclusive experience from these artificial tree houses. In Kerala, tourists can experience a stay in Tree House in the following tourist destinations. Tree House in Thekkedy (Periyar). Tree House in Vythiri (Wayanad). Most of the Tree Houses have master bed room, balcony, attached western style toilet with hot water, a mosquito net, coffee/tea maker etc. An air-condition may or may not be available. In most of the cases, an air conditioner is not available in tree house. Since the Tree House is within the premises of a resort, one can always expect additional facility like a room service, doctor on call etc. It is always suggested to check the facilities of a tree house before booking the same. Instructions to be followed in Tree House. All the above services are included in the total package that starts from Rs 8000 per person. No food is allowed inside of tree house. Only one couple is allowed inside. No guests are allowed to the tree house. Liquor and smoking are strictly prohibited . Children below 12 years are allowed in only family treehouses. As mentioned above, most of the tree houses are near to the forest or plantations, therefore insects, night flies, ants, mosquitoes etc. are common problems in Tree Houses. Since it is more nature oriented, frequent maintenance is required. Those who like to have something different; a stay in a tree house is always a memorable one. The best way to experience a tree house is to spend a full day in tree house with in-house resort activities. How Can Include Tree House Stay With Kerala Tour Package? As mentioned above, there certain tourist destinations in Kerala where Tree House stay facility is available. In case the tourist want to experience the same, look at tree houses at that place and include in the Kerala tour packages. We always recommend to advise from a reputed travel agents help so that the tree house stay can be perfectly fitted in their Tour Packages. Ensure that it’s a real tree house and not an artificial one. Check by which resort it is being operated and read reviews available. Location of Tree House and whether it has a good view available. Facilities available in the Tree House. Height of the Tree House and way to reach there. Tree house is located in a forest kind of area – always expect insects, night flies etc. In most cases, an extra bed or mattress cannot be placed in tree house. Since it is erected from the ground, staying with small children is not recommended. Those who have problems with step climbing try to avoid tree house stay. To make it more memorable experience, check in tree house during daytime and avoid after darkness. Is It safe to stay in Tree House? It is very safe to stay in Tree House as it is not located inside the forest and care of resort’s staffs is always available. Since it is erected from the ground, those who have kids along with them should take care of the children. Sometime the location of a tree house cannot be accessed by car; therefore, it is always advisable to check the proper location so that no surprises will greet you on arrival. Munnar is one of the best hill stations in Kerala. Some of the resorts in Munnar have constructed the tree house for their guests. Below are the Tree houses in Munnar. Nature Zone Resort, Tree House. This is located 12kms away from Munnar town and no direct access by car is available. The resort have jeep transfer facilities from to Munnar city area. The very best plus point of this resorts is its location. One can see the whole Munnar from this resort view point. 7 Spring Plantation Resort Tree House. This is located in a forest kind of area and operated by 7 Spring Plantation Resort. The tree house is well maintained and very good to stay for couple. It is located approx 100mtrs away from the resort. Dream Catcher Tree House. This Tree House is located approximately 30 kms away from Munnar town, on the way to Thekkedy. This is being operated by Dream Catcher resort, Since the approach road of 2kms is very bad, reaching this resort is little difficult. Kaivalyam Retreat Tree House. This tree house is an artificially made on iron pols and operated by Kaivalyam Retreat resort. Very close from Munnar town. Tariff of Tree House is always little higher due to huge expense for maintenance. Average price available is between Rs. 5000/- to Rs. 8000/- which may increase upto Rs. 10000/- in peak season dates. Most of the tree house provides dinner also in this price. A tree house experience is highly recommended round the year in Kerala except monsoon seasons. Monsoon starts in Kerala from June to August. One can expect heavy rain during July. We recommend avoiding a tree house stay during these times since access to tree house is difficult. Book Luxurious Hotels in Kerala. we are always available 24/7 online. Srees Tours & Travels – Owned by Mr Sreekumar MP, who served the INDIAN ARMY from 1984 to 2004. Posted to Defense Wing of Indian Embassy, Stockholm, Sweden.